Part of a series of murals across the state, Forest Grove was among cities chosen by Travel Oregon. A new mural in downtown Forest Grove is expected to be finished this week, depicting a colorful and cheerful landscape with the words "Oregon is Magic" splashed across it. The fact that it's even being painted at all is a big compliment being paid to the city. Forest Grove, along with The Dalles, Prineville, Oakridge, Ontario and Roseburg was chosen by Travel Oregon — the state's official tourism site — to be home to a mural, suggesting the city is an "undiscovered gem" worth visiting. 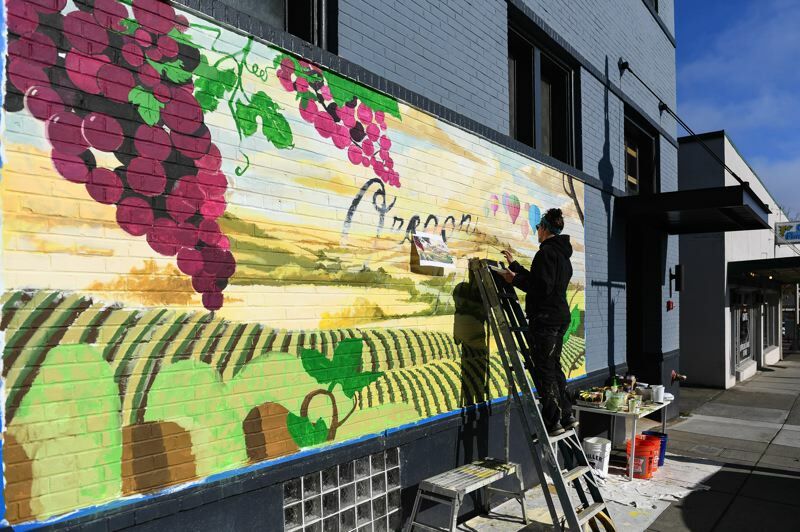 The mural's design, which is nearly complete on the side of the brick building at 2001 Main St., along Pacific Avenue, derives from a 90-second animated Travel Oregon campaign video created this past spring called "Only Slightly Exaggerated." The campaign video was based on classic animation and highlights the outdoor opportunities across the state, and it got more than 10 million views worldwide — an overwhelmingly positive response from viewers, said Travel Oregon's director of global communications, Linea Gagliano. "It was aimed at getting people outdoors, and encouraging people to find happiness all throughout Oregon," she said. "We are so tethered to our computers right now, and the news cycle is tough, and we just wanted to remind everybody that travel is good for you and it's good to get out, it's stress relief, and a really good place to do it is Oregon." Because of the positive response the campaign received, Travel Oregon decided to bring murals to seven tourism regions of Oregon, highlighting those communities as good places to travel to, Gagliano said. Forest Grove is one them. "The locations were chosen for a few reasons, one of them being that the communities had participated in one of Travel Oregon's rural tourism studios," Gagliano said. "(The studios aimed) to talk to the community about, 'What are your visions for the community? How do you see tourism playing a part to enhance livability in the area and increase jobs? And what are the ways that we can all work together to highlight those assets?' So Forest Grove participated in a rural tourism studio." It was more than participating in the tourism studio, though, that got Forest Grove recognized, Gagliano emphasized. "Beyond that, we wanted to make sure that where we are directing visitors to go, we want them to feel like they have found this undiscovered gem a little bit," she said. "Everyone is talking about Portland, which is wonderful, but ... just outside of Portland, there is Forest Grove and it's this incredible place where you have really great restaurants and wineries and a lot of really good things going on that would be surprising — those are the reasons." Travel Oregon worked with the chosen communities on deciding where the murals would be placed, Gagliano said, and local artists were hired to do the rest of the work. "My job is to lay it out and match the colors and get the image to look like it's supposed to," said Beaverton resident and artist Holly Henderson. "I really like it, because I am a transplant just like a lot of us are, and so I love Oregon, and the whole idea of Oregon being magic is super-true, because everyone out here is so happy. So I totally believe in what they are doing. It's pretty fun." 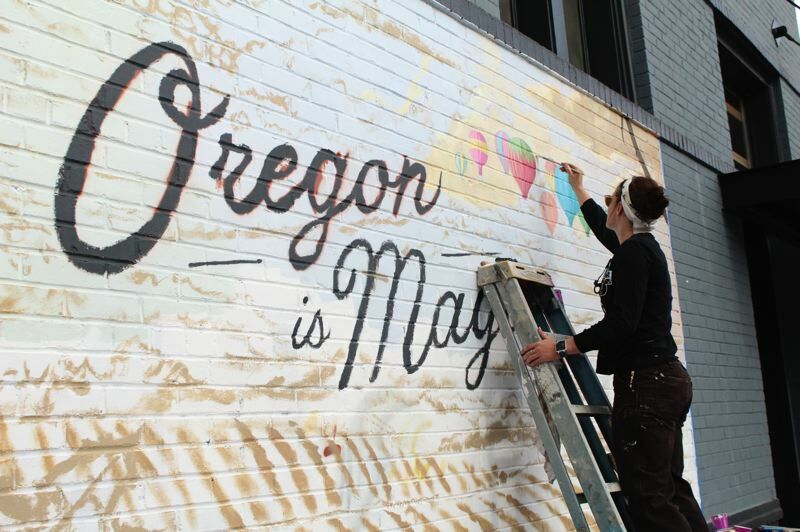 Travel Oregon hopes the murals — five of which are already completed — will send the same positive message across the state as the campaign video did. "I think it really highlights the cultural richness that we have in the state and a lot of the history we have. While these aren't historical murals — yet — it just really calls attention to who we are as a state and just our artistic roots and our maker roots and finding our way," Gagliano said. "Getting people to travel, and getting outdoors, and discovering new places is so good for you, and good for the local economies as well. And so it's really a win-win situation where we get people out and they go and spend their dollars in a community to see these murals. It's just that beautiful cycle that continues to help with jobs while you're also making people happy."